The Timberwolves Dancers just wrapped up their season a few weeks ago with a first round playoff exit. Despite the bittersweet loss for our hometown heroes, it's been quite a momentous year: the end of a 14 year playoff drought and a new logo and brand identity! The Timberwolves organization revealed their new look at the end of the 2016-2017 season. The logo was created by Rare Design, a firm known for its work with the Hawks, Hornets, and Grizzlies (among others), and is a refreshed version of the team's former secondary logo. The revised branding gives the Timberwolves organization a fresh face with bold new colors, graphics, and symbolism, but still maintains a strong tie to the iconic wolf and local landscape. Even the names of the new colors evoke a right association with Minnesota's outdoor tradition: Lake Blue, Aurora Green, Frost White, and Moonlight Grey. If you're as curious about the new logo as I was, check out the full story behind the new brand on the Timberwolves New Era website! With the new logo came a "New era, new look" campaign, meaning a complete redesign of the basketball uniforms, basketball court and arena, and dancers' uniforms! There was no transition period for the branding switch either. The old logo - along with the dancer's wardrobe - were completely abandoned. "Because they were re-branding with all new colors and eliminating black, none of their old apparel could be used. It didn't fit with the new brand," explained Deb Erickson, the design director at The Line Up. With a clean slate at hand, Athenia Williams, Head Coach of the Timberwolves Dancers, started planning a few signature looks for the dancers last July. They worked with designer and alumni dancer Jacquie Van Guilder to design a completely custom wardrobe that would incorporate their new branding, shown above. This fall, the team built the foundation for their new wardrobe with three custom uniforms. Consistent colors and branding across all three outfits meant they were able to mix and match easily. They built upon these signature pieces with other ready-to-wear items like t-shirts, hoodies, and jean shorts to create a more varied wardrobe for their grueling 40+ game schedule! Check out a video of their final looks, and a summary of each below. We love how the new neon Aurora Green and Frost White colors glow in the dark when the lighting in the arena changes! So cool! "Their first outfit was a quick turnaround for an exhibition game in China," said Megan, their account manager at The Line Up. By choosing two online styles and styling them in their new brand colors, they were able to get a new uniform in time for their pre-season game against the Warriors in Shenzhen. Their white top and short is emblazed with the new "Wolves" lettering across the front, and maintains a classic and sporty NBA look! The Navy top and leggings feature an athletic side stripe running down one leg, which incorporates the "A" from the Minnesota in the logo. This "team rune" mark holds strong significance for the Timberwolves and their new "All Eyes North" campaign. The character points north - like a compass - at the top of the logo, and is symbolic of many things in Minnesota. It represents a growing geographical "North" pride, our heritage by referencing Nordic runes (or symbols), and a new shift in direction for the team: looking toward the future with a fresh perspective. The majority of NBA dance teams either attend pro dance conventions or hire outside choreographers to help with the demand of dance routines needed for the season. Here at the Timberwolves, we create all choreography in-house. It is a collaborative effort from myself (Head Coach – Athenia Williams), Assistant Coaches (Camille Sherman & Tracy Schindeldecker) and Captains (Demi & Kayla). We pride ourselves on challenging our crew each season to not repeat any choreography each person has done from a prior routine. So far, nothing has been repeated in the past five seasons. Due to the NBA game schedule including 40 + home games, there is a need to keep fans entertained with new and fresh choreography each game. Once in a while we may repeat a routine for a second time (especially during a week when we have one rehearsal to prepare for three to four games), but if we can avoid that, we try to. This season the Timberwolves Dancers performed 31 routines, including special productions with G Eazy, Lil Jon, Prof and P.O.S. They also learned 12 sideline routines for fourth quarter Hot Time Outs. 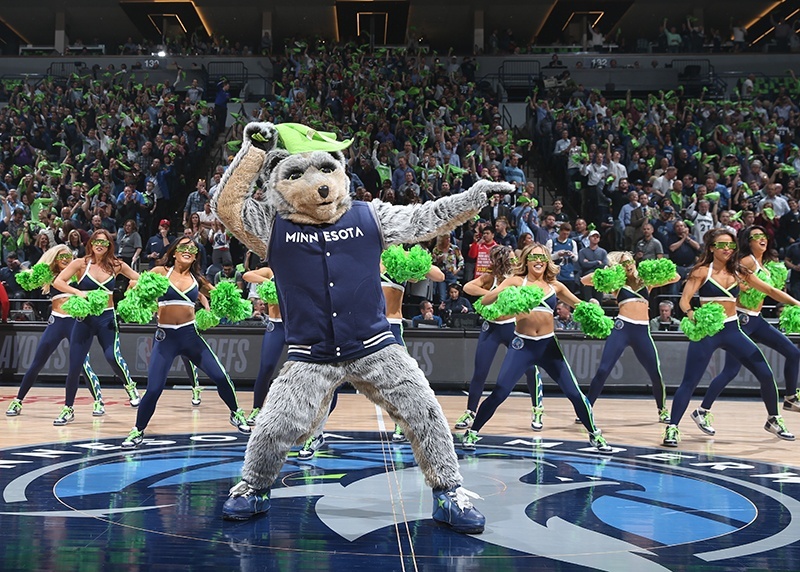 During the NBA Playoffs, which the Timberwolves were a part of this season for the first time in 14 years, the dancers performed a mix created by DJ Digie – a local Minnesota DJ, that had over 5 songs compiled together. This was voted the Timberwolves Dancers favorite routine of the season (due to all of their favorite songs being in it). Check out the Timberwolves Dancers Instagram (@wolvesdancers) to hear the mix and see the routine. What is your favorite memory this season? My favorite memory of this season was watching my dancers take the court for their first performance during our home opener game. When I witnessed all the things we practiced and prepared them for (during the two months prior) look so effortless for the first time, it made me so incredibly proud to be their coach and reassured me that I had the best NBA dance team for the 17-18 season.